New York: His cheeks red, hair matted with sweat, Novak Djokovic appeared to be in such distress as he trudged to a changeover on a steamy US Open afternoon that someone suggested it would be a good idea to have a trash can at the ready, just in case he lost his lunch. He was not even one hour into his first match at Flushing Meadows in two years, and while Djokovic eventually would get past Marton Fucsovics 6-3, 3-6, 6-4, 6-0 Tuesday, it was a bit of an ordeal. With the temperature topping 33˚C and the humidity approaching 50 per cent — and that combination making it feel more like 40˚C — nearly everything became a struggle for every player across the grounds on Day 2 of the US Open, so much so that no fewer than six quit their matches, with five citing cramps or heat exhaustion. About two hours into the day’s schedule, the US Tennis Association decided to do something it never had at this tournament: offer men the chance to take a 10-minute break before the fourth set if a match went that far. That is similar to the existing rule for women, which allows for 10 minutes of rest before a third set when there is excessive heat. The whole thing raised several questions: Should the genders have the same rules moving forward? Should the US Open avoid having matches during the hottest part of the day, not just for the players’ sake but also to help spectators? Should the men play best-of-three-set matches at majors, instead of best-of-five? Should the 25-second serve clock, making its Grand Slam debut here, be shut off to let players have more time to recover between points? “Bloody hot,” said two-time major semi-finalist Johanna Konta, who lost 6-2, 6-2 to No. 6 Caroline Garcia. “Brutal,” said 2014 US Open champion Marin Cilic, who advanced when his opponent retired in the third set. “Really not easy,” said three-time Grand Slam title winner Angelique Kerber, who defeated Margarita Gasparyan 7-6, 6-3. 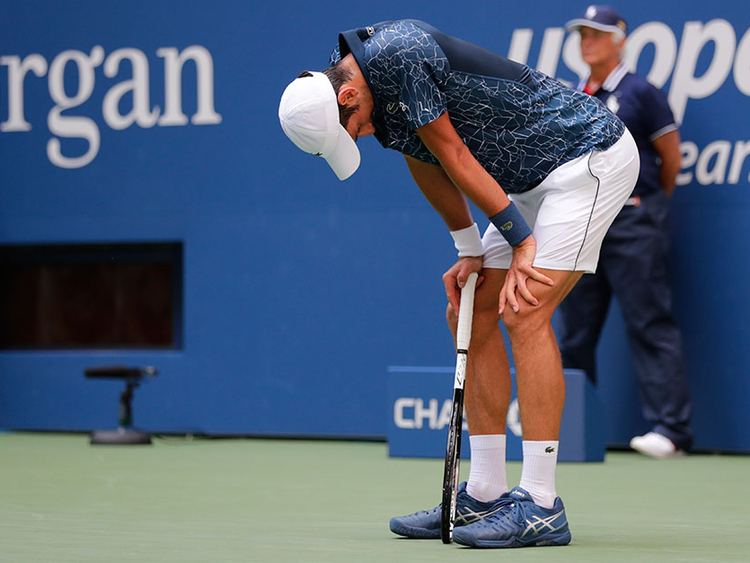 “Everything is boiling — in your body, the brain, everything,” said Djokovic, who’s won two of his 13 Grand Slam titles in New York but sat out last year’s US Open because of an injured right elbow. He is a popular pick to hoist the trophy again, coming off a Wimbledon title in July and a victory over Roger Federer in the final of the hard-court Cincinnati Masters in August. Federer was among those lucky enough to play a night match on Tuesday, beating Yoshihito Nishioka of Japan 6-2, 6-2, 6-4. Federer’s third-round opponent could be the entertaining, if mercurial, Nick Kyrgios, the 30th-seeded Australian who had 25 aces and 14 double-faults while defeating Radu Albot 7-5, 2-6, 6-4, 6-2. Because action began at 11am, and the USTA implemented the heat rule for men at about 1pm, those playing in the earliest matches weren’t able to get that sort of relief. Men’s first round: Roger Federer (2) beat Yoshihito Nishioka 6-2, 6-2, 6-4, Novak Djokovic (6) beat Marton Fucsovics 6-3, 3-6, 6-4, 6-0, Kei Nishikori (21) beat Maximilian Marterer 6-2, 6-2, 6-3, Frances Tiafoe beat Adrian Mannarino (29) 6-1, 6-4, 4-6, 6-4, Nick Kyrgios (30) beat Radu Albot 7-5, 2-6, 6-4, 6-2. Women’s first round: Caroline Wozniacki (2) beat Samantha Stosur 6-3, 6-2, Petra Kvitova (5) beat Yanina Wickmayer 6-1, 6-4, Jelena Ostapenko (10) beat Andrea Petkovic 6-4, 4-6, 7-5, Madison Keys (14) beat Pauline Parmentier 6-4, 6-4, Naomi Osaka (20) beat Laura Siegemund 6-3, 6-2, Maria Sharapova (22) beat Patty Schnyder 6-2, 7-6, Kirsten Flipkens beat CoCo Vandeweghe (24) 6-3, 7-6.